A number of alkylated (quaternized) and acylated derivatives of low–molecular weight chitosan were obtained. The structure and composition of the compounds were confirmed by the results of IR and PMR spectroscopy, as well as conductometric titration. The effect of the acyl substituent and the degree of substitution of N-(2-hydroxy-3-trimethylammonium) propyl fragment appended to amino groups of the C2 atom of polymer chains on antibacterial activity against typical representatives of gram-positive and gramnegative microorganisms (Staphylococcus epidermidis and Escherichia coli) was studied. The highest activity was in the case of N-[(2-hydroxy-3-trimethylammonium)propyl]chitosan chloride (HTCC) with the maximal substitution (98%). The minimal inhibitory concentration of the derivative was 0.48 μg/mL and 3.90 μg/mL for S. epidermis and E. coli, respectively. Original Russian Text © B.Ts. Shagdarova, A.V. Il’ina, V.P. 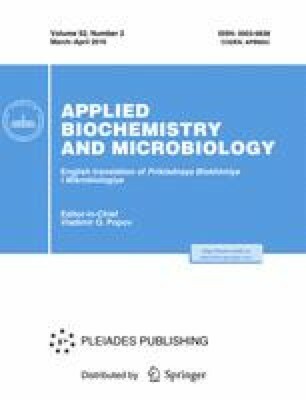 Varlamov, 2016, published in Prikladnaya Biokhimiya i Mikrobiologiya, 2016, Vol. 52, No. 2, pp. 237–241.